I have not written lately because I have been ill, first with bronchitis then with mumps. Mumps? I know. I can hardly believe it too! So, I spent three weeks on my sofa, watching the passage of time through my lanai windows. 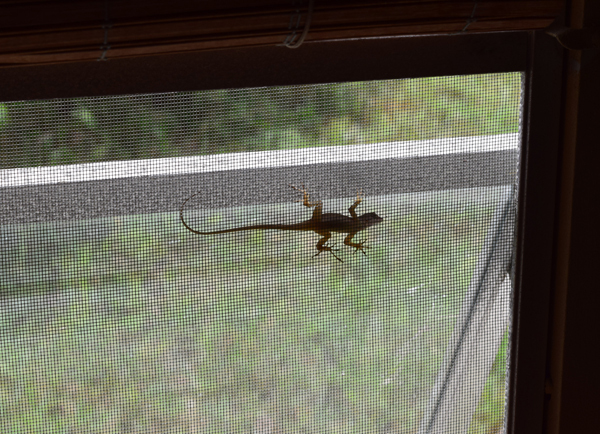 Every day, there was this one little lizard, which are very common in Florida, who came to sit on the outside of the window screen. Each morning, he would climb up the five feet to the very the same spot, to get warmed by the sun. Safely tucked under the louvered glass window pane, he was safe from wind and snakes. And, every day, in the early afternoon, he would climb back down, probably on the search for food. Like clockwork, the next morning, he was back again. I named him "Mortie." Lesson 1: STOP PRESSURING MYSELF TO GET THINGS DONE. The world did not come to an end because nothing got done for three weeks on my long "To Do" list. Lesson 2: MAKE TIME TO NOTICE THE SMALL MIRACLES. Mortie the lizard, that little life form, is just one of the many incredible animals and plants around me everyday. Get too busy, and I pass right without seeing and appreciating them. Lesson 3: ENJOY THE MUNDANE. A good night's sleep, tasting food, painting, laughing, talking with loved ones, walking in nature, even grocery shopping all now seem delightful. I wish you all good health and a wonderful day.